eru is located in the west central part of South America. It encompasses an area of 498,222 square miles (1 `285, 215 km2) and can be compared in size to Spain, France and former West Germany combined. In South America, only Brazil and Argentina are larger. Peru is the 19th largest country in the world. Peru is bordered to the north by Ecuador, to the south by Chile and Bolivia, to the east by Colombia and Brazil and to the west by the Pacific Ocean. 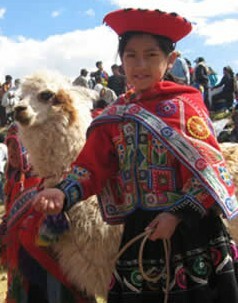 Peru is a varied and diverse country due to the climatic, natural and cultural diversity of its regions. It is 1,554 miles (2,500 km) long, and has 3 natural regions: coast, sierra and jungle. The climate of Peru varies widely, ranging from tropical in the montaña to arctic in the highest mountains of the Andes. Average temperatures decrease about 1.7 Celsius degrees (about 3 Fahrenheit degrees) with every 450-m (1,500-ft) increase in elevation. Permanent snow and ice fields cover peaks more than 5,000 m (16,500 ft) above sea level, and the highest elevation at which the land is suitable for agriculture is about 4,400 m (14,500 ft). The coastal region accounts for 10.6% of Peru's territory 52,639 square miles (136,334 km2). It is a narrow strip 1,554 miles long (2,500 km), but only 12 to 62 miles wide (19 to 100 km). The altitude along this strip varies from zero to 3,281 feet above sea level (1,000 m). Although the coastal strip is mainly arid, seasonal rains occur in the north, especially during periods of El Niño climatic phenomena. Along the coast, less than 1 million hectares of the total 15 million are irrigated, Some of the 52 valleys are arable and they are farmed using a combination of ancient Peruvian methods and modern technologies The Peruvian coastal region has been home to several important cultures. Visitors can find many well-known archaeological sites here, including Chan-Chan, Nasca and Sipan. In the coastal plain the temperature is normally equable, averaging about 20° C (about 68° F) throughout the year. The coastal climate is moderated by winds blowing from the cool offshore current known as the Peru, or Humboldt, Current. The coast receives less than 50 mm (less than 2 in) of precipitation each year, largely because the cordilleras receive most of the rain carried by the trade winds from the east. Mist-laden clouds known as garúa shroud many of the slopes of the sierra from June to October, providing enough moisture to support grasslands. Sierra is the name given to the Andean highland region, where the Andes mount range runs through the country north to south like a backbone, dividing the coastal region from the jungle. The sierra offers a wide diversity of landscapes which vary according to the altitude. The Sierra makes up 30.5% of the nation's territory 151,304 square miles (391,876 km2) and is between 52 and 155 miles wide (83 to 250 km). The average altitude is 14,108 feet above sea level (22,705 m). The Peruvian Andes have more than 174 snow-capped peaks over 16,000 feet (4,877 m) in height and 39 peaks over 19,600 feet (5,974 m) in height. The highest and most formidable of them all is Mt. Huascaran at 22,205 feet (6,768 m). High plateaus, at altitudes ranging from 12,500 to 14,100 feet (3,810 to 4,298 m) above sea level, contrast sharply with deep canyons such as those formed by the Apurimac, Cotahuasi and Colca Rivers. The sierra region has both arid areas and fertile valleys. Vivid blue skies form a stunning backdrop to the soaring peaks and are reflected in many glittering lakes. The world's largest navigable lake, Titicaca, is an incredible tourist resource for Peru thanks to its scenery, history, archaeological sites and beautiful colonial towns. In the sierra the temperature ranges seasonally from about -7° to 21° C (about 20° to 70° F). Rainfall is usually scanty, but in some localities heavy rains fall from October to April. 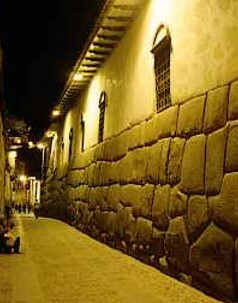 In Cusco, in the southeastern sierra, annual rainfall averages some 815 mm (some 32 in). The exposed eastern slopes of the Andes receive more than 2,500 mm (100 in) of rain annually, but sheltered locations receive much less. Rainfall amounts diminish rapidly southward, causing many changes in the vegetation. The highland jungle, known locally as "ceja de selva", is located on the eastern flank of the Andes. Its average altitude is between 1,600 and 9,200 feet above sea level (487 to 2,804 m). A variety of tropical and subtropical products (coffee, tea, cocoa, citrus fruits, bananas, pineapples, etc.) grow amidst its luxuriant vegetation. This region, unlike the sierra, has a temperate and humid climate and it is also the smallest region in the country. 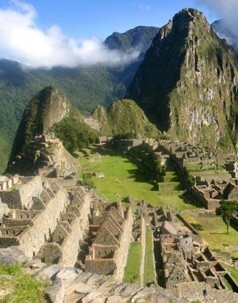 Machu Picchu, our most important tourist destination, is located in this environment. Peru’s climate periodically experiences a weather pattern known as El Niño. El Niño occurs every three to seven years when unusually warm ocean conditions appear along the western coast. During El Niño the wet weather conditions normally present in the western Pacific move to the east, bringing heavy rains that can cause extensive flooding. Peru has three main drainage systems. One comprises about 50 torrential streams that rise in the sierra and descend steeply to the coastal plain. The second comprises the tributaries of the Amazon River in the montaña region. In the third the principal feature is Lake Titicaca, which drains into Lake Poopó in Bolivia through the Desaguadero River. The Napo, Tigre, and Pastaza rivers rise in Ecuador and flow into Peru. The latter two streams are tributaries of the Marañón River, and the Napo empties into the Amazon River. The border between Peru and Colombia is delineated by the Putumayo River. The plant life of the three main geographical regions varies widely. The vast, fertile montaña contains a rich profusion of trees, plants, and jungle vines, including mahogany, cedar, rubber, and cinchona trees, sarsaparilla and vanilla plants, and a variety of exotic tropical flowers. The rugged sierra supports a relatively sparse plant life. Sierra vegetation is largely xerophytic—that is, adapted to survival on a restricted supply of water. Such growths include mesquite, cactus, scrub and fodder grasses, and eucalyptus plants. The dry, sandy reaches of the coastal plain support mainly desert vegetation, such as shrubs, grasses, and tuberous plants. The wildlife of coastal Peru is limited in number and variety. The coastal plain and offshore islands support gulls and terns and some albatrosses, but little other wildlife except lizards, insects, tarantulas, and scorpions. Peruvian ocean waters abound in anchovy, pilchard, haddock, sole, mackerel, smelt, flounder, lobster, shrimp, and other marine species. In the sierra are found the llama, alpaca, vicuña, chinchilla, and huanaco. Birds of the region include the giant condor, robin, phoebe, flycatcher, finch, partridge, duck, and goose. Lake Titicaca and other sierran bodies of water teem with fish. Animals of the tropical montaña include the jaguar, cougar, armadillo, peccary, tapir, anteater, several dozen species of monkey, alligator, turtle, and a variety of snakes and insects; among the birds are the parrot, the flamingo, and other tropical species. About 45 percent of Peru’s inhabitants are Native Americans, some of whom are descended from the Inca who established a great civilization in the region by the 15th century. About 100 other indigenous groups live in the rain forest of eastern Peru. These tribes live in virtual isolation from the rest of Peru’s population, speaking traditional languages and surviving by hunting, fishing, and agriculture. Some 37 percent of the country’s people are mestizos, those of mixed white (mainly Spanish) and Native American background. About 15 percent of Peruvians are of unmixed white descent, and many of the remainder are of black African, Japanese, or Chinese ancestry. Some 72 percent of the people live in urban areas. Population Characteristics The population of Peru (1998 estimate) is 26,111,110, giving the country an estimated overall population density of 20 persons per sq km (53 per sq mi). The distribution, however, is uneven, with about 50 percent of the people inhabiting the sierra region and about 40 percent inhabiting the coastal plain. The largest city in Peru is Lima (greater city population, 1996 estimate, 6,884,000), the country’s capital and chief commercial center. Other important cities include Callao (637,755), a major port located near Lima; Arequipa (680,600), an industrial center; Trujillo (556,800), a commercial center; Chiclayo (457,800), in the sugar district; and Cusco (257,751), famous for its Inca ruins. Spanish, spoken by some 70 percent of the people, was the sole official language of Peru until 1975, when Quechua, one of the principal languages of the Native Americans, also was made an official language. Another Native American language, Aymará, was declared official in 1980. English is also spoken. More than 90 percent of Peruvians adhere to the Roman Catholic religion. In 1915 a law was passed that made Roman Catholicism the established religion of the country. However, the constitution of 1979 ended Roman Catholicism's status as the established religion, although it recognized Catholicism "as an important element in the historical, cultural, and moral formation of Peru." Other religions are permitted and tolerated, and small numbers of Protestants, Jews, and Muslims live in Peru. Education The literacy rate in Peru has increased substantially as a result of greater emphasis on education. According to estimates, the adult literate population rose from 42 percent in 1940 to 89 percent in 1995. Public basic education in Peru is free and compulsory for all children between the ages of 6 and 12. Many children in rural areas do not attend secondary school, however, because of a lack of facilities. In 1995 some 4.1 million pupils attended elementary schools, and 1.9 million students were enrolled in secondary and vocational schools. The pentatonic scale used by the ancient peoples still survives, and pre-Columbian instruments such as the reed quena or flute, the antara or panpipes, conch shells, the ocarina, and various primitive percussion devices are widely used today. The Spaniards brought stringed instruments. The violin, the harp, the guitar, and the charango, a mandolinlike instrument, are very popular. Among the most popular folksongs and dances are the yariví, a love song; the huayno, a rapid dance of the highlands; the cashua, a circle dance; and the marinera or zamacueca. Lima has a national conservatory and a symphony orchestra, the latter organized in 1938 by Austrian-born Theo Buchwald. The orchestra encourages Peruvian composers by performing their compositions. The most distinguished 20th-century Peruvian composer is the Paris-born André Sas, who founded a music school in Lima in 1929. His compositions reflect the influence of native music. Sas was also an authority on folk music. Peruvian literature began during the 16th century when Garcilaso de la Vega, son of a Spanish conqueror and an Inca princess, wrote his Comentarios reales de los incas (1609; Royal Commentaries of the Incas, 1869), a vivid historical chronicle about the Inca culture and empire. Another important writer of the colonial period was 17th-century satirist Juan del Valle y Caviedes. The foremost writers of the 19th century were Manuel González Prada, who wrote social criticism, and Ricardo Palma, who composed a collection of historical and legendary tales about Peru's past. In the 20th century there has been an abundance of poets and prose writers. Among them are Ventura García Calderón, a diplomat who was also an essayist; José Carlos Mariátegui, a Marxist political essayist; and the poets José Santos Chocano, César Vallejo, and José María Eguren. Ciro Alegría, in his famous El Mundo es ancho y ajena (1941; Broad and Alien is the World), has produced one of the finest novels treating the plight of the indigenous peoples in Latin America. Mario Vargas Llosa is an internationally famous novelist. One of Latin America's most important literary critics is Luis Alberto Sánchez. The theater has played an important role in the cultural life of Peru since 1568, when the first play in the country was presented in the plaza of San Pedro in Lima. During the colonial period, the Jesuits promoted dramatic productions, and 18th century viceroy Manuel de Amat was a leading patron of the theater. The country's leading playhouse and concert hall is Lima's Municipal Theater. Sebastián Salazar Bondy and Enrique Solari Swayne are the most important 20th-century playwrights. Some of the most important libraries in Peru are located in the larger cities and are affiliated with the major universities. Within the various libraries of the National University of San Marcos in Lima are more than 450,000 volumes. The National Library (1821), in Lima, houses more than 3.2 million books and other items. Museums throughout the country display Peruvian art and archaeological artifacts. Many of Peru's colonial buildings, such as the Torre Tagle Palace and the cathedral in Lima, contain valuable artifacts. Notable museums in Lima include the Museum of Art (1961), the Rafael Larco Herrera Archaeological Museum (1926), the Javier Prado Natural History Museum, and the National Museum of Anthropology and Archaeology (1822), which displays collections of pre-Columbian artifacts. Other important museums include the Military History Museum of Peru (1946), in Callao; and archaeological museums in Arequipa, Cusco, Huancayo, and Trujillo. Peru’s system of railroads, highways, and airports has been expanded considerably in the second half of the 20th century. The country’s mountains make surface transport difficult, however. In 1996 Peru had about 72,800 km (about 45,236 mi) of roads, of which 10 percent were paved. The main artery is a section of the Pan-American Highway, which traverses Peru from Ecuador to Chile, covering a distance of about 2,495 km (about 1,550 mi). The Central Highway links Lima and Pucallpa. Peru also has about 1,691 km (about 1,051 mi) of railroads. One trans-Andean line, the Central Railroad, ascends to some 4,815 m (some 15,800 ft) above sea level, the highest point reached by any standard-gauge line in the world. The most notable inland waterway is the Amazon River, which is navigable by ship from the Atlantic Ocean to Iquitos in Peru. Lake Titicaca also serves as a waterway. Leading Peruvian seaports include Callao, Salaverry, Pacasmayo, Paita, and San Juan. 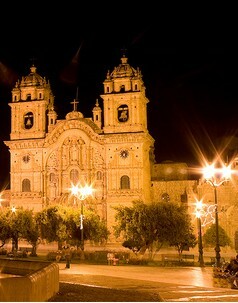 The country’s main international airports are situated near Lima, Cusco, Iquitos, and Arequipa. Aeroperú, the national airline, offers domestic and international service. Peru’s telephone system, which was nationalized in 1970 and reprivatized in 1994, has 68 mainlines for every 1,000 of Peru’s residents. The country is served by more than 300 radio stations and 8 television stations. In 1996 there were 271 radios and 125 television sets in use for every 1,000 people. In the same period the country had 74 daily newspapers. Dailies with large circulations included El Comercio, Expreso, Ojo, and La República, all published in Lima. In 1998 the average life expectancy at birth in Peru was 72 years for women and 68 years for men; the infant mortality rate was 43 per 1,000 live births. Although the government has made some progress in improving medical facilities, sanitation remains inadequate, and a cholera epidemic in 1991 killed more than 1,000 Peruvians and sickened another 150,000.